94 pages | 7 B/W Illus. The book introduces how we can manage currency options with the Vanna-Volga method. 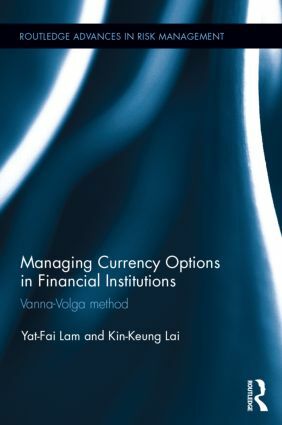 It describes the underlying theories and applications of the Vanna-Volga method in managing currency options of a financial institution, conforming to the Basel III regulatory requirements which demand a high consistency between the valuation and market risk calculation methodologies of financial instruments. The book illustrates with technical details to shed understanding on the major applications, including valuation, volatility recovery, dynamic portfolio replication and value-at-risk. Those who study finance, risk management, quantitative finance or similar areas, as well as practitioners who wish to learn how to valuate, hedge and manage the market risk of currency options with more advanced models and techniques will find the book of invaluable use. Yat-fai LAM is the Principal at Structured Products Analytics of CapitaLogic Limited, an adjunct faculty teaching master programmes in banking/finance/financial engineering/financial services at City University of Hong Kong and an adjunct dissertation supervisor of The University of Warwick’s Master of Science programmes in Hong Kong. Prior to assuming his current positions Yat-fai has worked for a bank regulator, an international bank, an asset management firm and a credit rating agency, specializing in the implementation of Basel New Capital Accord. Kin-keung LAI received his PhD at Michigan State University in 1977 and is currently a Chair Professor of Management Science at the City University of Hong Kong. He is the President of the Asia-Pacific Industrial Engineering and Management Society, the General Secretary of the Hong Kong Operational Research Society and a council member of the International Federation of Operations Research Societies. His main research interests include supply chain and operation management, forecasting, computational intelligence and risk analysis.